The cover of the Kabul Taxi Facebook page which was removed from Facebook last month. “Life is bitter, the future is unknown” reads the message on the back window of a Kabul Taxi, a little yellow Toyota that became the new face of political satire in Afghanistan until it disappeared from Facebook last month. The message was at once ironic and insightful, speaking both to the short, precarious existence enjoyed by Kabullians’ favourite imaginary cab and to Afghanistan’s own unknowable destiny, all of which existed in the form of a Facebook page. The anonymous author of the page wrote imaginary accounts of his experiences driving a fictional cab that ‘picked up’ passengers of high profile — often senior government officials — and converted their political discussions into pithy posts en route to their destinations. Although the discussions never actually took place, they were often uncomfortably realistic and revealing for the men in the back seat. With social media use growing in Afghanistan at the same time that trust in traditional media, which is often politically compromised, is declining, satirical outlets like Kabul Taxi have emerged as a space for Afghans to express dissatisfaction over the country's current path. Citizens’ frustrations with corruption, nepotism, insecurity and unemployment all found a home in the satirical hatchback. It made them laugh, and helped them scream. The page's 13,000 fans became 600,000 in the same month the Washington Post wrote three consecutive stories on the cab. But just as Kabul Taxi looked as if it might fly, somebody put the breaks on it. 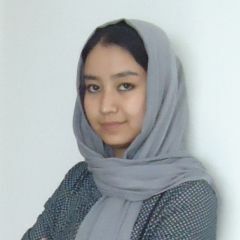 Facebook blocked the page shortly after it picked on President Ghani’s National Security Advisor, Hanif Atmar, and his cohort of 27 young advisors, who Kabul Taxi portrayed as the spoiled children of warlords and the Afghan political elite. Hanif Atmar's letter to the NDS. Widely shared. The post titled ‘Hanif Atmar’s Mantra Group’, commented on the high salaries of the young advisors and how they came to be appointed. Atmar, who served as an intelligence operative for the communist regime during the 1980s, did not appreciate the satire. He sent a letter to the National Directorate of Security (NDS) — Afghanistan’s national intelligence agency — and asked them to look into the case. Atmar's primary complaint — indicated on the right by the author of this post — was that the satire disclosed the identity and duties of National Security Council staff in a demeaning way that put their lives at risk. While such an allegation deserves consideration, it seems far more likely Atmar was motivated to write the letter by wounded honour. 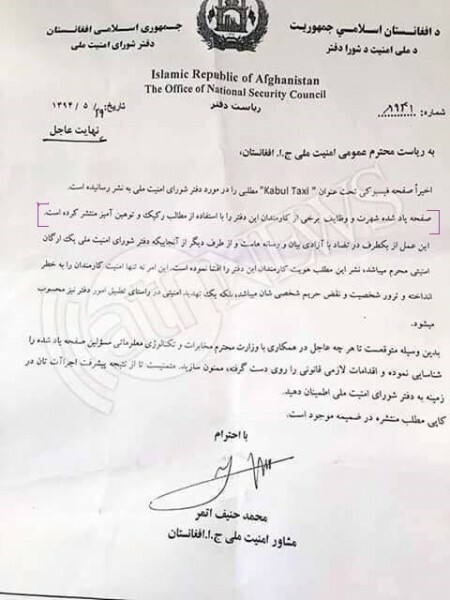 On August 22 and 23 the NDS summoned the senior editors of a local newspaper for interrogation under suspicion that they were responsible for the page. Although the journalists were released, the incident sparked a substantial backlash on social media. By the start of September, Kabul Taxi was out of service. 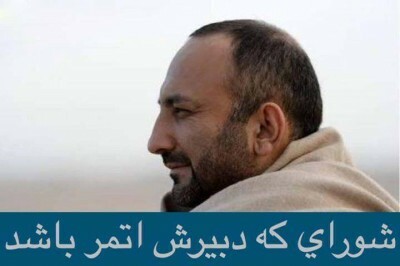 “The council whose instructor is Atmar” reads the text below an image of Hanif Atmar, National Security Advisor. Posted by Kabul Taxi. 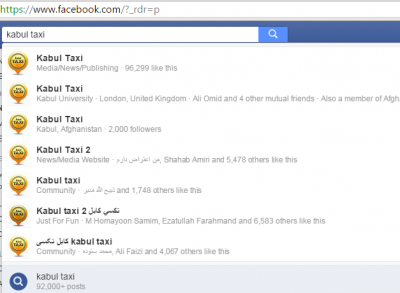 The closure might be seen by some as a worrying sign of Facebook bending to the will of national governments, but the social media network has not stopped several pages with similar names and aims that emerged shortly after Kabul Taxi was closed down. All the new taxis claim to be driven by the same driver. Among the more credible heirs to the throne is a page that enjoys over 96,000 likes and claims to be the ‘true new Kabul Taxi’. Frustrated by a number of pages sharing the same post, Afghan Facebook users are confused as to which taxis are fake and which are not. The gap left by the page in terms of satirical content is possible to fill, but what many are missing is the storm of discussion that accompanied each post on the original Kabul Taxi page. That is unlikely to return, unless its author is willing to risk the consequences of disclosing his identity. Just a month after it disappeared, Afghans are nostalgic for their favourite ride, praying it is out there somewhere, waiting to reclaim its adoring audience in full. [Translation from Pashto inscription on the window of a Kabul car]: Long Time No See!